RECIPE TITLE "Lemon-Ginger Crème Brûlée"
This recipe is fromThe Barbecue! Bible Copyright © 1998 by Steven Raichlen. All rights reserved. 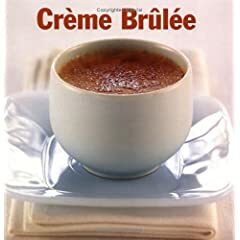 This is a book about live-fire cooking, so I thought it only natural to include a few variations on crème brûlée (literally burnt cream). Despite their current trendiness, these burnt sugar desserts have been around a long time. Originally, the sugar was caramelized with a fire-heated poker. Although you could caramelize the sugar by running the brûlées under the broiler, these days there's a better method available--the kitchen blowtorch. This is my favorite way to do this--first, because it's in keeping with the live-fire theme of this book; then, because it gives you a very hot, concentrated, and controlled flame that burns the sugar without warming the custard beneath it. As for the crème brûlée here, fresh ginger and lemon zest give it a haunting Asian accent that makes for a particularly refreshing summer dessert. 1. Combine the cream, ginger, and lemon zest in a heavy saucepan. Bring just to a boil over medium heat. Remove the cream from the heat and let cool to room temperature. 2. Preheat the oven to 300°F. Bring a large saucepan or kettle of water to a boil. 3. Combine the egg yolks and granulated sugar in a large bowl and whisk just to mix. Whisk the cooled cream into the yolk mixture. Strain this custard mixture into 6 crème brûlée dishes or ramekins. Pour boiling water to a depth of 1/2 inch into a roasting pan. Place the crème brûlée dishes or ramekins in the roasting pan. 4. Bake the custards until just set, 45 minutes to 1 hour. To test for doneness, gently shake a dish; the top should jiggle just a little. Remove the dishes from the roasting pan and let cool to room temperature. Cover the custards loosely with plastic wrap and refrigerate them for at least 6 hours, or overnight. 5. When ready to serve, sprinkle each of the custards with 2 to 3 teaspoons of the turbinado sugar in a thin layer. Light a kitchen blowtorch following the manufacturer's directions. Or preheat the broiler and set the broiling rack 2 to 4 inches from the source of the heat. 6. Use the kitchen blowtorch to caramelize the tops of the custards, following the instructions below. Or arrange the crème brûlée dishes on the broiling rack and broil the custards until the tops have crusted to a rich, golden brown, about 3 minutes; watch carefully to prevent burning and shift the crème brûlées as needed to ensure even browning. Serve at once. The great British pudding is alive and well and this book demonstrates exactly why. 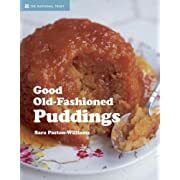 This collection of established favorites and little-known but great recipes traces the history of the pudding—from the earliest medieval spiced jellies through the elaborate pies of the Elizabethans and Stuart and the elegant custards of the Georgians to the substantial puddings of the Victorians. All the best recipes that have stood the test of time are provided here with sumptuous photography. Indulge in Roly-Poly Pudding and Damson Cobbler or savor elegant and delicate Marbled Rose Cream and Blackcurrant and Mint Fool. Anyone who enjoys a healthy dose of great British puddings will find their ultimate comfort foods collected here. Everybody loves a fool -- especially made fluffy with ripe strawberries or tangy apple. From the author of The New Irish Table comes this celebration of the Emerald Isle's classic desserts. 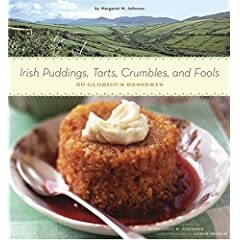 From lemony puddings and marmalade-slathered scones to fruit-filled tarts and berry-laden crumbles, these contemporary renditions of the traditional desserts of Ireland make perfect use of common staples such as oatmeal, fruit, dairy products, and, of course, whiskey. Steel-Cut Oat Pudding is enhanced with orange zest, nutmeg, and plump golden raisins. A chocolate, walnut, and caramel tart becomes a treat for grownups with a splash of the hard stuff. A final chapter offers the most memorable of holiday delectables including mincemeat tarts, Christmas pudding, and a really good fruitcake. A glossary and source list define and locate unusual ingredients. With gorgeous painterly photographs depicting the food and countryside, this wonderful cookbook serves as a sweet reminder of the people and cuisine of Ireland. It's time for panna cotta to get its due as a dessert classic. An exquisitely silky custard, panna cotta is at its most basic a confluence of cream, gelatin and sugar, and a short list of other ingredients that lend it flavor. Molded in ramekins--or more simply set and served in glassware or cups--it has both a homey provenance and refined austerity, making it an ideal partner for a wide range of sumptuous trimmings from bittersweet chocolate to balsamic strawberries to Cabernet caramel sauce. Yet despite its luxurious texture and chic presentation, panna cotta is one of the easiest desserts to prepare: soften some gelatin, warm some cream and sugar, combine the two, and the cooking is done. It can be made up to a day ahead, too, making it as ideal for an haute cuisine supper party as for the close of a cozy weeknight meal. Come serving time, simply unmold and garnish--that's it. If the crowd is large, recipes are easily doubled or tripled; if the occasion is intimate, simply halve the recipe. Since there is no baking involved, the proportions remain equivalent. Panna cotta is more than a dessert dream come true, too: it can also be a savory first course. Made from a combination of cream with vegetable purees, cheeses or fresh herbs, these panna cotte are in a class of their own in taste, style and presentation. And like their sweet siblings, savory panna cotte have the enticements of ease, style and sophistication. Within these pages, you will find 100 recipes celebrating panna cotta. The first five chapters offer a suite of sweets; the sixth, a baker's dozen of savory options. All are centered on ease of preparation, with flavors ranging from subtle to bold and everywhere in between, with plenty of innovative interpretations as well as tried and true classics. In addition, you'll also find recipes for myriad panna cotta accompaniments--sauces, gastriques, jams, syrups, fresh fruits, sugared rose petals, marrons glacés and more--that are as delectable and simple-to-assemble as the panna cotte themselves. Have fun mixing and matching flavors to create desserts or first courses that truly reflect your style and taste. So enjoy the charms of panna cotta, they are many, and may a plethora of these recipes will make their way into your dessert and first-course repertoire. With a flick of the whisk, Italy's elegant custard can be yours. Delicious and sophisticated yet elegantly simple, crème brûlée deserves its status as one of the world's most famous desserts. Few can resist its delectable charms. 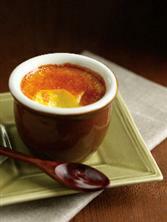 In Crème Brûlée, Sarah Lewis presents 40 easy-to-make crème brûlée recipes to delight friends and family. For those who have never made a brûlée, she provides careful, step-by-step instructions. More experienced cooks can turn right away to the more exotic flavor combinations, both sweet and savory: - Raspberry and Champagne Brûlée - Chocolate Rum Truffle Brûlée - Salmon and Scallion Brûlée - Goat Cheese and Sun-Dried Tomato Brûlée - Vanilla Bean Crème Brûlée - Apple Pie Brûlée - Mini Spinach and Tomato Lasagna Brûlée. From the classic to exciting new flavors, this book will turn any cook into a crème brulée pro.